I am really hoping that there’s a great turnout for tomorrow’s Belltown Green and Clean. It would be a great show of support to the neighborhood, not to mention a great way to meet your neighbors while scrubbing some funk out of btown. 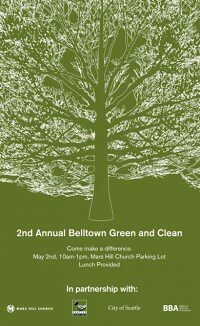 This year’s Green and Clean is a partnership between Mars Hill Church – Downtown, City of Seattle, Paint Out, Belltown Business Association, and the Belltown Community Council. Show up at 2333 Western, May 2 – 10AM. Word is, free lunch will be provided. Hope to meet a lot of you there!